Lady Bracknell (Sharon Lockwood, center) confronts Miss Prism (Trish Mulholland, right) as others look on. In Oscar Wilde’s “The Importance of Being Earnest,” two young women separately vow that they must marry a man named Earnest. In an effort to win their hands, two young men pretend they’re named Earnest. Of course their schemes backfire, but all works out well. Presented by Aurora Theatre Company, Wilde’s satire of late 19th century manners is full of his signature bon mots. However, this production directed by incoming artistic director Josh Costello doesn’t always work as well. This is especially true in the first scene in London, where Algernon Moncrieff (Patrick Kelly Jones) welcomes a visit by his friend, Jack Worthing (Mohammad Shehata), who’s in love with Algernon’s cousin, Gwendolen Fairfax (Anna Ishida). 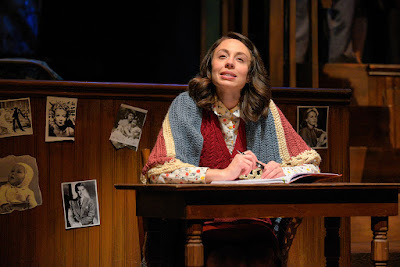 Jack has a manor house in the country, where he’s responsible for his ward, Cecily Cardew (Gianna DiGregorio Rivera). In order to go to London occasionally, he pretends he has a wastrel brother named Earnest there. The conversation between the two men seems stilted and mannered, as if they were trying too hard to be witty and sophisticated. 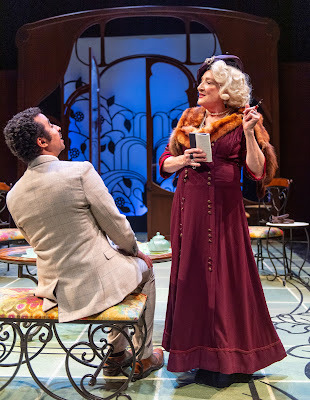 Lady Bracknell (Sharon Lockwood) questions Jack (Mohammad Shehata). Everything brightens, though, with the arrival of Algernon’s aunt, the formidable Lady Bracknell (Sharon Lockwood), and her daughter, Gwendolen. Lockwood's Lady Bracknell commands the stage with her imperious ways and her impeccable timing. Jack, whom Gwendolen knows as Earnest, proposes to her, but Lady Bracknell forbids the engagement because Jack is an orphan. In the meantime, Algernon is intrigued by Jack’s description of Cecily and is determined to meet her. He goes to Jack’s manor house in disguise, but the various deceptions are soon uncovered, leading to the play’s resolution. In addition to any time with Lockwood, the second act has an amusing scene involving what amounts to a cat fight between the two young women, but they immediately make up when they discover what’s going on. Another performance that stands out is Trish Mulholland as Miss Prism, Cecily’s governess. Michael Torres does double duty as Lane, Algernon’s discrete manservant, and as the Rev. Canon Chasuble, Miss Prism’s would-be suitor. 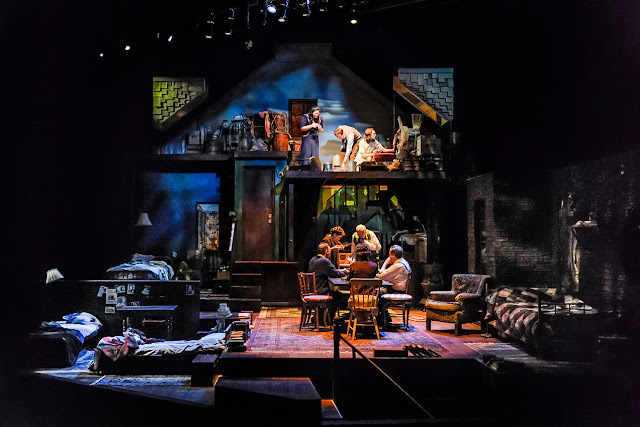 The handsome but spare and flexible set is by Nina Ball with lighting by Wen-Ling Liao. The elegant costumes are by Maggie Whitaker. Chris Houston serves as sound designer and composer. Despite shortcomings by the two young men, the overall production is quite enjoyable thanks to Wilde’s wit and Lockwood’s performance. 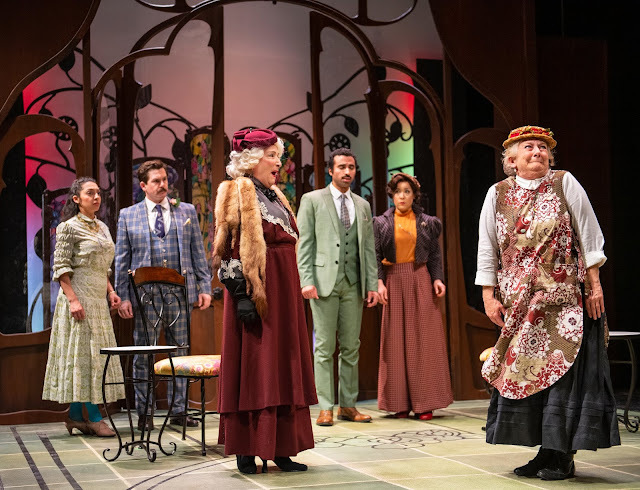 Running about two and a half hours with two short intermissions, “The Importance of Being Earnest” will continue through May 12 at Aurora Theatre Company, 2081 Addison St., Berkeley. For tickets and information, call (510) 843-4822 or visit www.auroratheatre.org. “Hershey Felder: A Paris Love Story” actually is several love stories. This one-man world premiere presented by TheatreWorks Silicon Valley tells of Felder’s love for the City of Light as well as his love for the music of Claude Debussy (1862-1918). It’s not the first time this creator/performer has focused on a great composer. Some of his past shows, most of them seen at TheatreWorks, have featured the music of George Gershwin, Irving Berlin, Leonard Bernstein, Beethoven, Liszt and Chopin. This time he takes a more personal approach, weaving some of his own family history into Debussy’s. Felder’s mother, whom he cherished, loved Debussy’s music and always wanted to see Paris, but she couldn’t make it. Instead Felder first went there as a 19-year-old and took in the sights that Debussy loved so much. 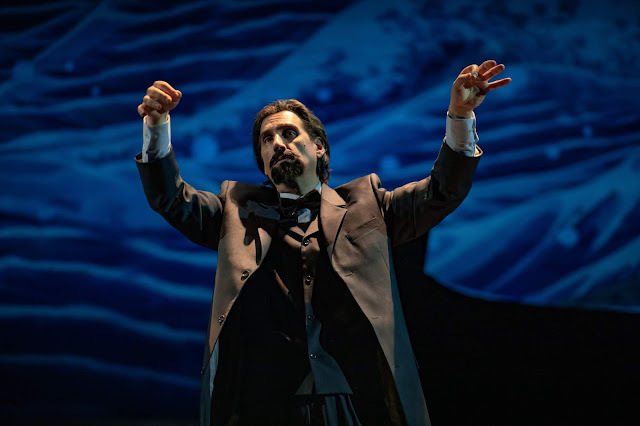 Costumed as Debussy (design by Stacey Nezda), he mostly tells the story in Debussy’s voice, referring to Felder as “the boy” and relating Debussy’s own history. It starts with his early life, continues with his musical education and delves into his romantic liaisons. This narrative is interspersed with frequent sessions at the grand piano, which sits center stage between two arching bridges on the handsome set designed by Felder. There piano virtuoso Felder plays some of Debussy’s best-known works, such as “La Mer,” “Prélude à l’après-midi d’un faune” and the dreamy finale, “Clair de lune,” Felder’s mother’s favorite. Some orchestral excerpts also are heard (sound design by Erik Carstensen). He sees parallels between the final years of Debussy, who never quite recovered from an experimental colostomy, and his own mother, who underwent a double mastectomy. He has Debussy telling how he defied musical conventions of the time, earning mostly pans from critics along with some praise. Besides music, the greatest love of his life was his daughter, nicknamed Chouchou. As the young Felder explores the streets and sights of Paris, projections by lighting designer Christopher Ash illustrate the narrative. Directed by Trevor Hay, this show is both a visual and aural delight, treating the audience to an absorbing concert and story by the multi-talented Felder. Running about an hour and a half with no intermission, “Hershey Felder: A Paris Love Story” will continue through May 5 at the Mountain View Center for the Performing Arts, 500 Castro St., Mountain View.